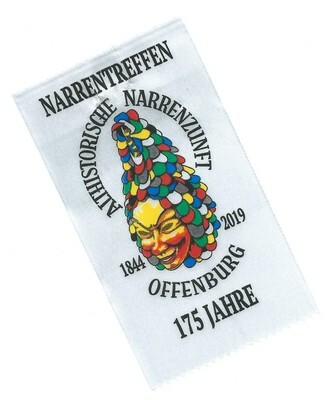 In 2019, the older one of Offenburg's two jester guilds are celebrating their 175th anniversary. 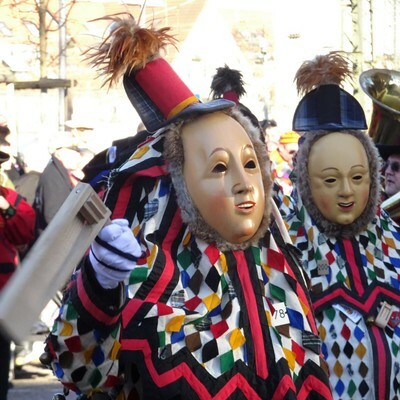 Reason enough to hold a jester meeting. 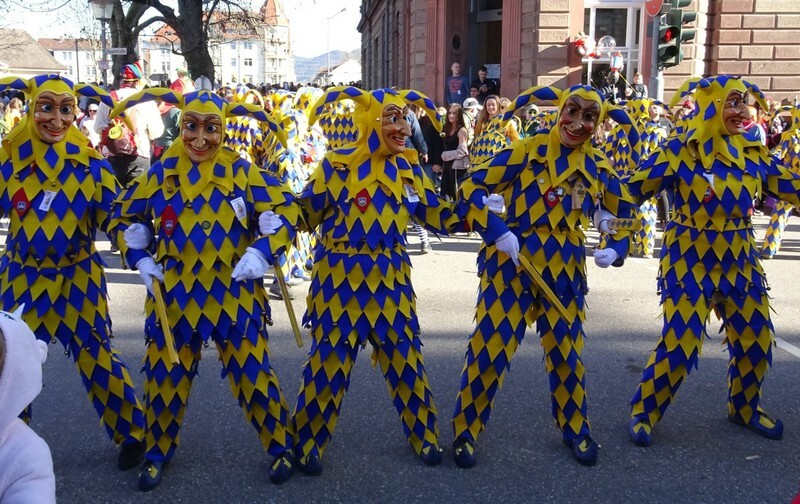 Being members of VSAN, the association of Swabian-Alemannic jester guilds, theirs was classified as one of the three official big VSAN landscape meetings of the year. 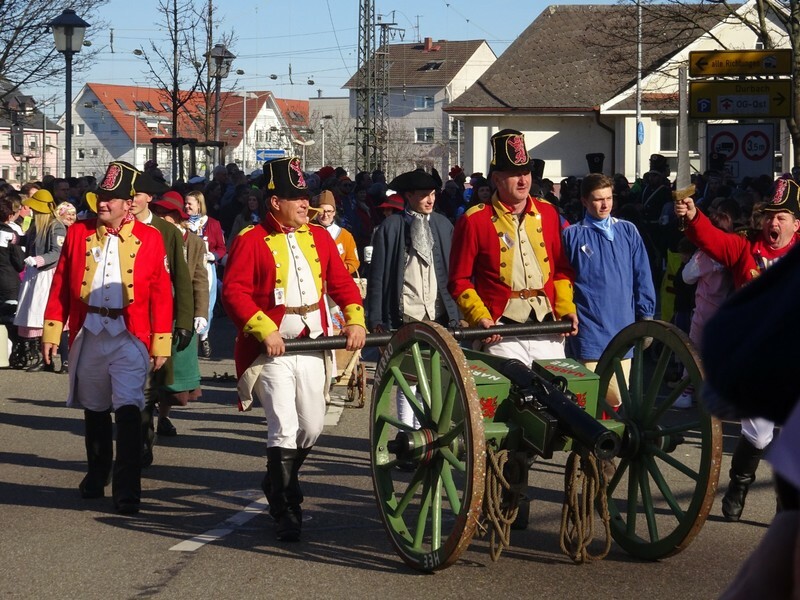 About 40 member guilds joined, many of them traditional and well known, plus some smaller guilds from Offenburg's surroundings. 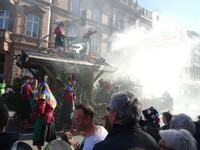 They all came with large groups, so the parade took at least 3 hours, despite the relatively short list in the programme. 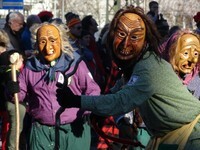 It was mid February, but the organizers as well as the spectators were granted the most glorious, sunny and mild weather conditions this month is capable of. 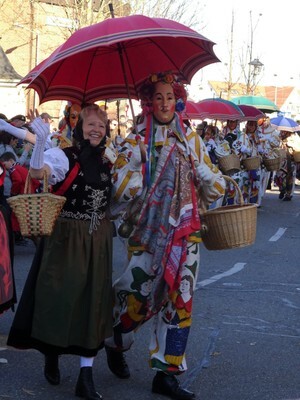 A perfect day for a festive parade. A funny witch guild, ready to put on a show and do some acrobatic tricks, like pole jumping runs with their broomsticks, and building pyramids. 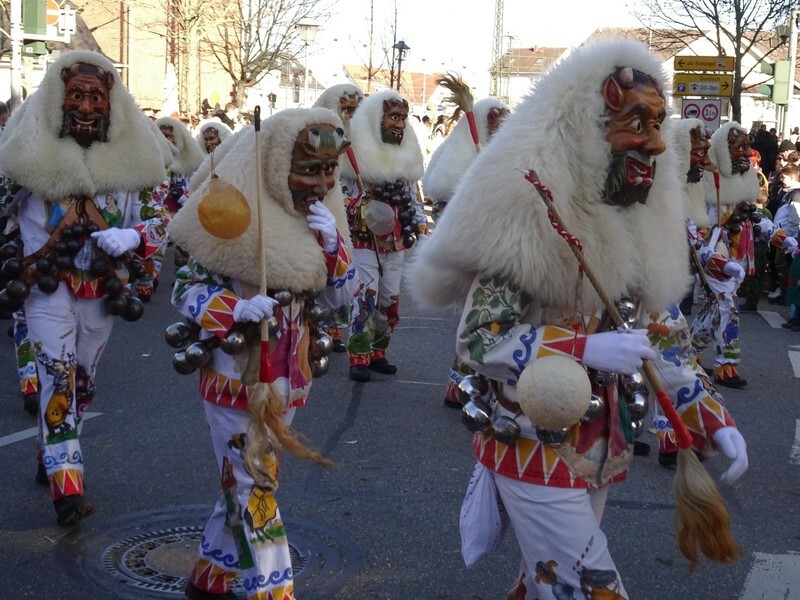 A Guggemusik band is a must in Switzerland, these came as fancy dragons. 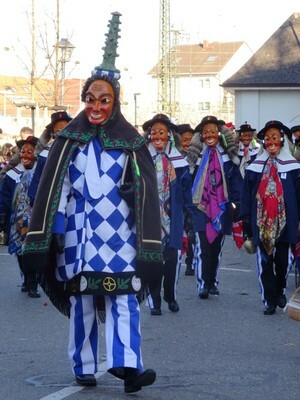 But the guild's Häs figure is the Nüssler. Loaves of bread, not sure if real and how old and hard, are stuck onto his broomstick. 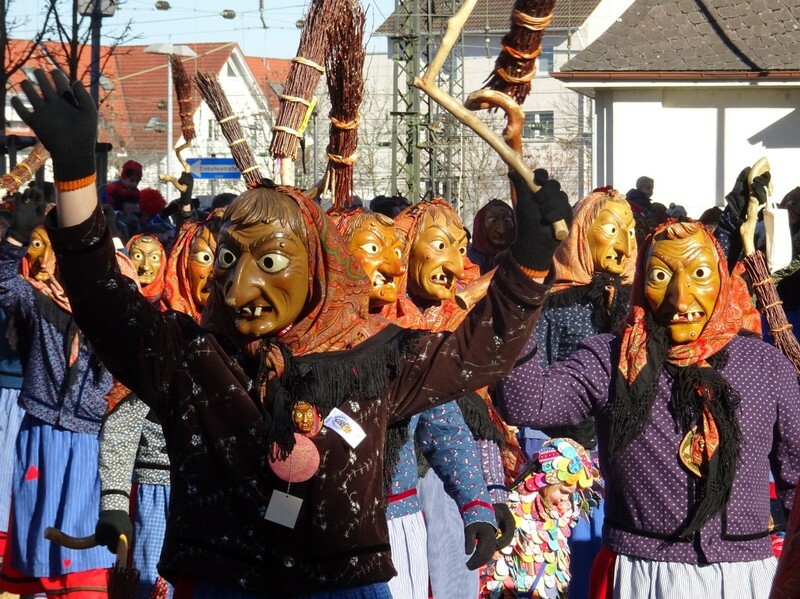 Aulendorf is famous for its witch guild, probably one of the largest. 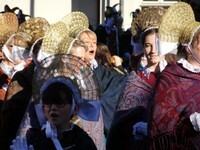 Their striking feature is the colourful headscarf, embroidered with witch symbols. 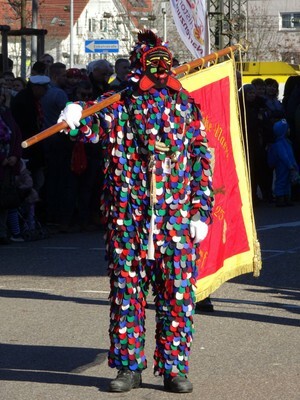 Mocking the military is part of carnival all over, also in the Rhineland version. 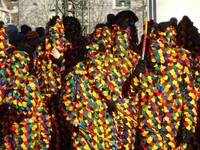 In the lands of Alemannic Fastnacht many guilds, too, have military troops in colourful uniforms. Some of them have a cannon with them - and beware if they stop next to you, hold your ears and keep your mouth open until the BANG is over. 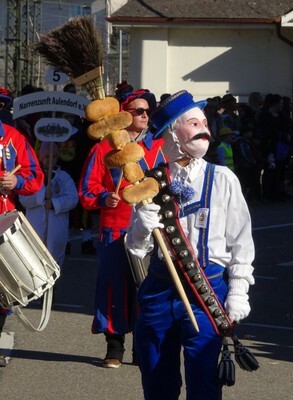 Otherwise, it's all about bread in Munderkingen. 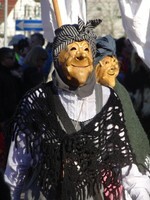 The masks carry baskets of bread on their heads, necklaces made from bread rolls, and so on. These are not real bread, though, they are fakes made from wood. 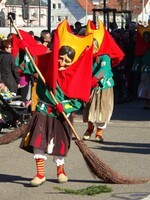 And they have those funny witches with their oversized headcovers. 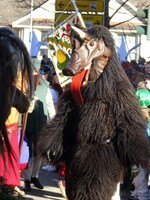 The Hänsele is a typical figure of the Bodensee area. 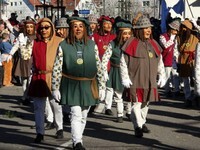 Its origins are in Überlingen, and the Markdorfer version cannot deny its close geographical vicinity. 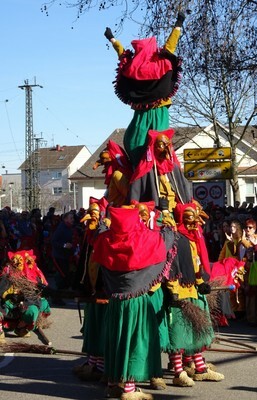 Cute-faced foreest spirits also come to life in Markdorf. 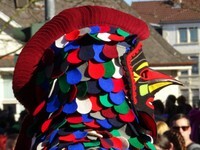 Colourful with a wide variety of masks. 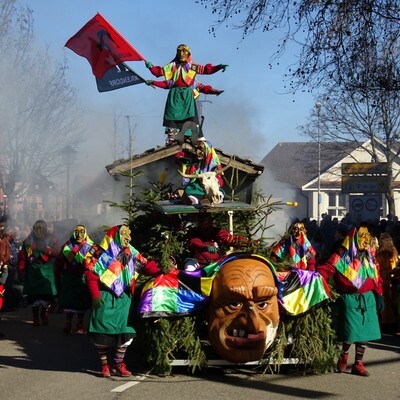 Wolfach is probably the place with the largest number of parades, and in addition to that the Wolfachers are always out and about to visit neighbouring places. 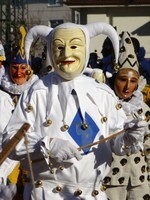 The blue and yellow Bajass is a classical jester figure based on the Italian commedia dell'arte. Friendly laughing fellows they are, and they come in all sizes. 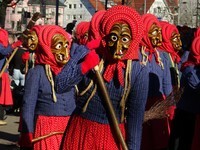 But there are also the witches from Kandel, Waldkirch's house mountain, in their guild. Just like any other witch guild they are always prone to mischief. 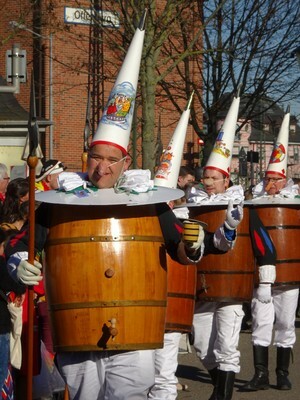 The most popular figures in Haslach, that's certainly Ranzengarde, a troop of marching guards in wine barrels. 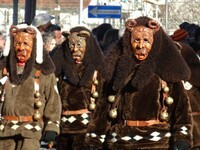 The name of the town bears a reference to hazelnuts, or can at least be interpreted as such. 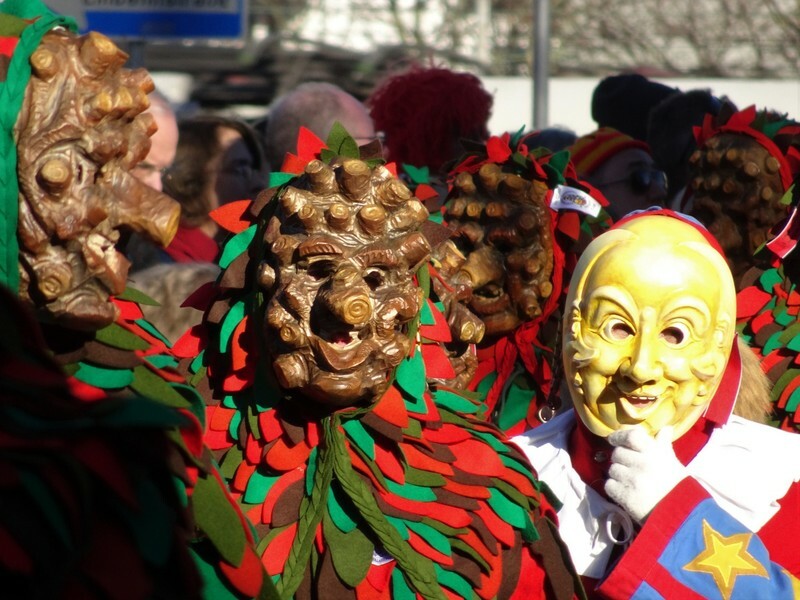 The hazel bush is shown in the town's coat of arms, and during Fasnet they come to life. 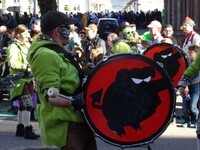 These fellows with the funny name were new to me. 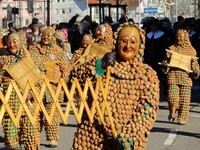 "Karnöffel" almost sounds like "Kartoffel" (potato), and the faces show a certain resemblance. 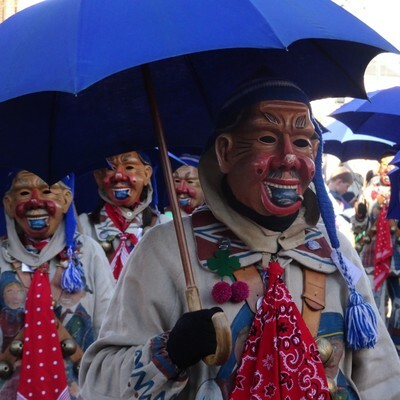 There are wild figures in their guild, but also laughing townspeople. 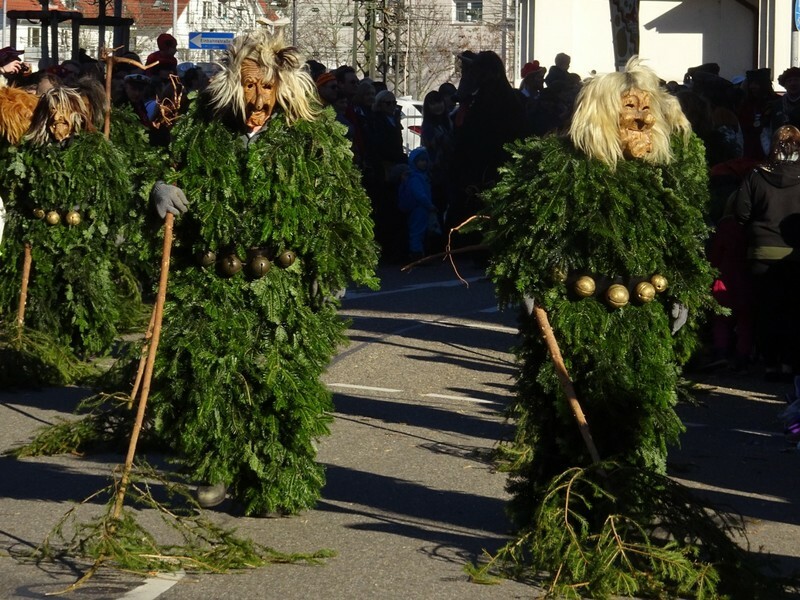 The most spectacular sight, though, is the group of walking trees. 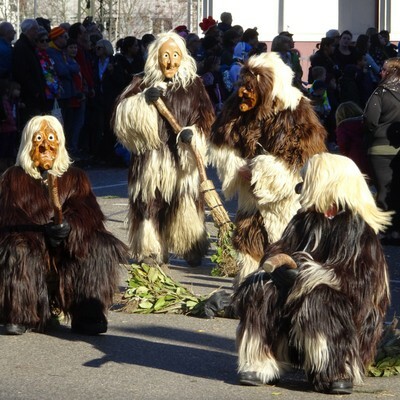 They are based on an old legend about the spirits in a nearby mountain ridge. And there is the terrible Stadttier, a ghost in the shape of a dog, who is led and guarded in chains by the night watchman. 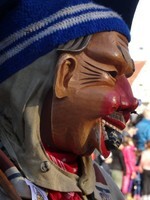 The local Guggemusik band uses his image as their logo. 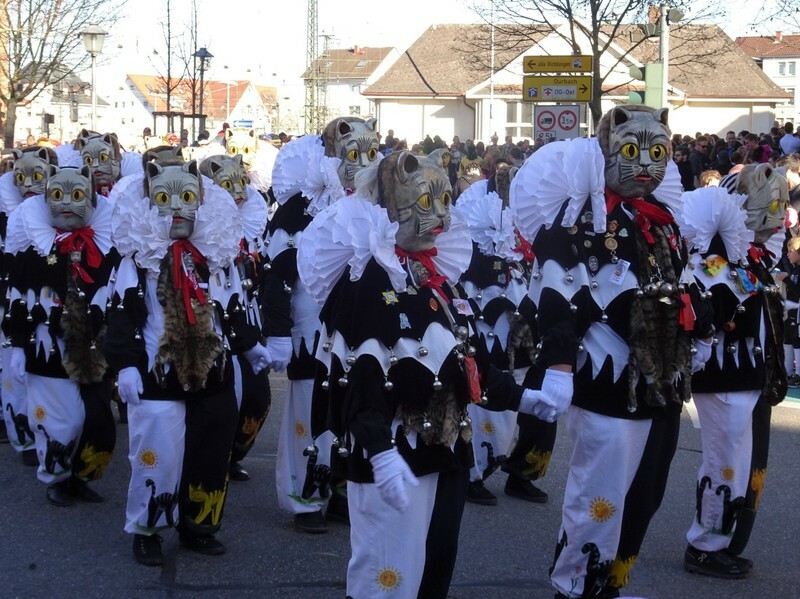 The cat guild of Messkirch is widely considered one of the most beautiful animal Häser in the Alemannic Fastnacht. They look certainly amazing. 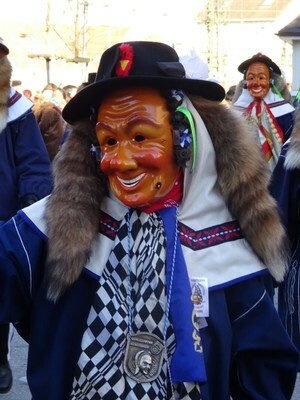 I am a bit reluctant towards the (real) cat furs that are part of the Häs, though. The guild states that all furs come from legal sources and that all these cats had died a natural death before their fur was taken. I am leaving it at that. 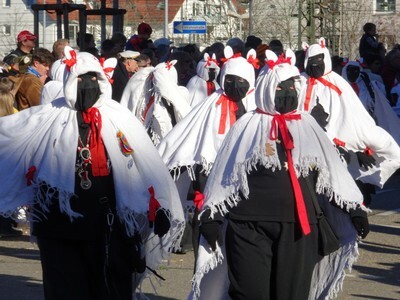 A much simpler and cheaper Häs, nevertheless impressive, is the Messkirch bat, created from a bedcloth, some ribbons and other household items. 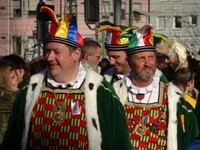 Stockach's jester council is the most famous feature. 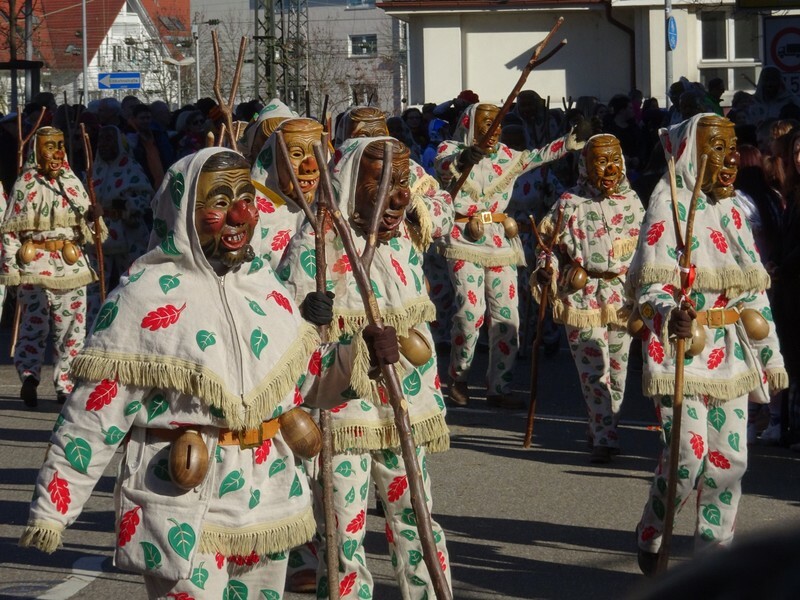 The Hänsele in typical Bodensee style, the ladies in traditional dress with the golden lace bonnets and some other figures are also essential parts of Stockach's Fasnet. 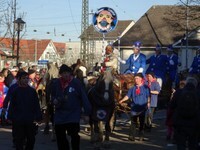 Bad Cannstatt is now a suburb of Stuttgart but used to be an independent town. Its citizens proudly display some legends from their history, although these may lead to the conclusions that the old Canstatters were not the brightest candles on the Christmas tree, so to say. 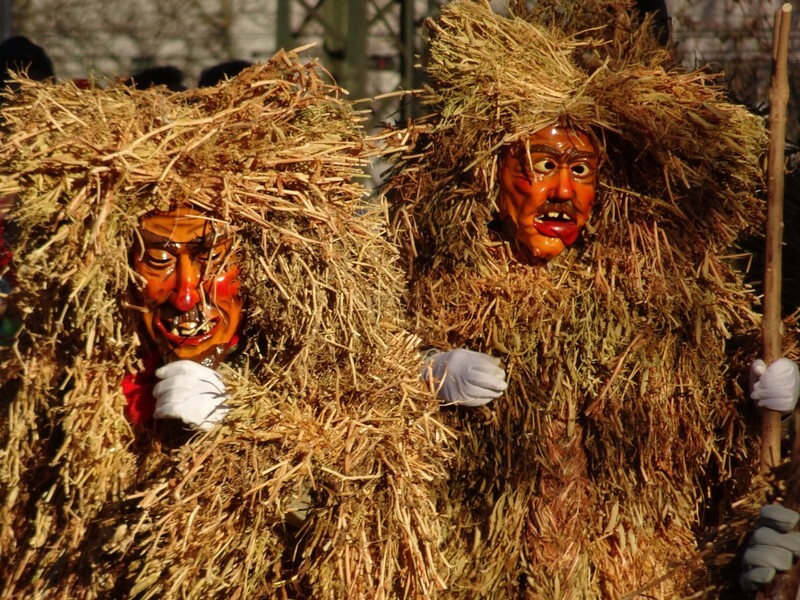 Once on a foggy day the guards spotted approaching French troops in the fields and feared a siege of their town... but when the fog lifted, the 'soldiers' turned out to be the stumps of pollard willows, in local dialect called "Felbeköpf". Another story, which explains the presence of the moon faces, tells of an alarm raised by the local fire brigade when they thought that their steeple was on fire, but the glow was in fact caused by reflected moonlight. 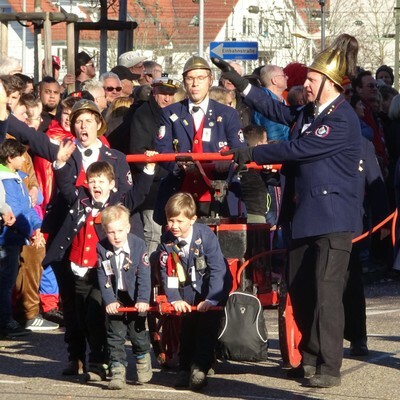 The fire brigade is present in the parade, too. 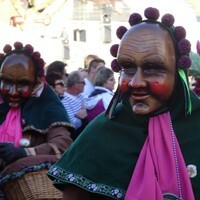 The "Plum Swallowers" of Bonndorf are referring to, just like the Cannstatter figures, a certain reputation concerning the villagers' lack of genius. 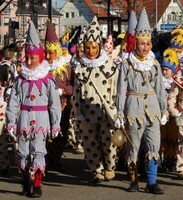 Bonndorf is located high up in the Black Forest and has a rough climate where fruit would not grow. 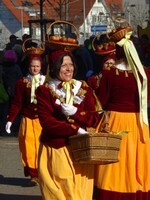 When the Bonndorfers were given the first plums ever, they tried to swallow them in whole, pit and stem and everything. 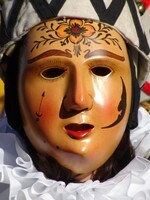 This anecdote lead to the creation of a funny Häs with a plum stuck in the mask's mouth. The umbrella is an inevitable utensil in the mountain climate. 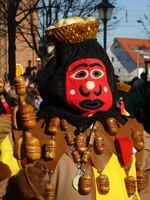 The Butz is the typical figure in Haigerloch and other areas in Swabia. Hölzlekönig is a solitary figure referring to the once tallest fir tree in Germany (they sai), which unfortunately had to be felled, only the still majestic stump remained. 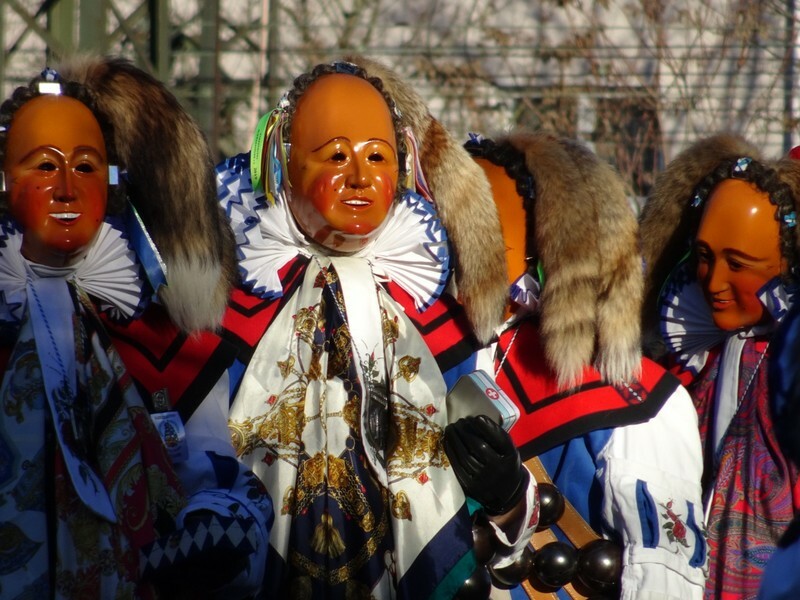 In addition to that, Schwenningen has figures who cannot deny their close vicinity to neighbouring Villingen and its ancient traditions, and also the cute Moosmulle, a Häs for females only. 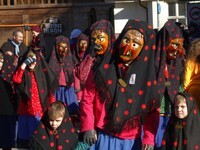 White Narros with painted Häs, typical for these eastern parts of the Black Forest.